Something caught my eye this morning whilst cycling past the bunker on Reinhardt Straße. Not the fact that a penthouse apartment is being built on its top floor – hardly worth mentioning – but something more subtle. The light was good. The low-angled winter sun must have been just at the right inclination, for there, projected onto the ceiling of the bunker’s new room with a view, was a distinct watery ripple. Yes, it all makes sense. If you can buy a bunker, then you can afford a pool. And obviously, you’re going to build the pool into the only part of the bunker which sees any daylight: the roof. And because you’re a bunker-buying, roof-pool kind of metropolitain studmuffin, then you’re not going to be satisfied with calling your pool a pool. You’re going to insist upon terms like ‘wellness suite’, or ‘health spa’. 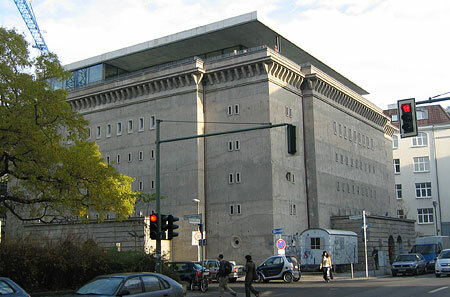 The studmuffin in question is Christian Boros – in advertising, art collector – who fell in love with the bunker – built in 1941 by Hitler – and bought it with the intention of living in it, bathing in it, and displaying his art collection in it, which includes works by Wolfgang Tillmans, Tracey Emin and Damien Hirst. The bunker has, sensibly, 2.6 meter thick walls and is therefore indistructable. Attempts to destroy it at the end of WWII failed because, according to The Age, there wasn’t enough dynamite left in the city to get rid of it. I suspect that the amount of TNT you’d need to reduce the structure to rubble would also be enough to vaporise the whole of Mitte and parts of Tiergarten at the same time. According to a colleague of mine, in East Germany the building was used to store butter in.